This storage box is made from heavy duty .090 thick aluminum, its welded construction makes for a sturdy container that will last for years. It features dual lifting handles, heavy duty construction, aircraft quality hinges and heavy duty lid. 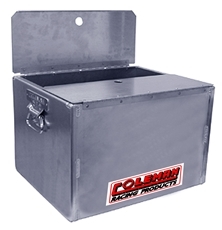 It is ideal for storing tools, gauges, engine parts, spare chassis parts and more.